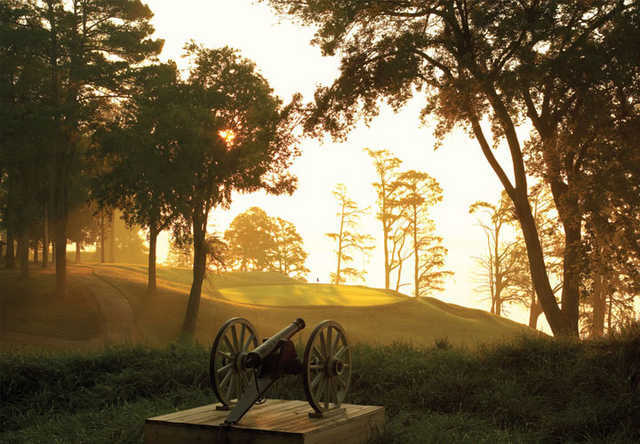 Thanks to its strategic and inviting position overlooking the James River, the tee box features clearly visible remnants of the earthen works (a hastily made fort or defensive structure) from the American Revolution, which was then repurposed (location, location, location) in the War Between the States. Today a Civil War cannon and flag guard this sacred ground. We’re sure some golfers would like to use the cannon to launch their ball to the tee (not allowed). But well before aggression – or the early settlers who arrived to this very shoreline to seek a new home –Native Americans lived here and enjoyed the oysters still plentiful and being served up at the 19th hole at Kingsmill. Today, when golfers walk between the tee box and the green at the River Course’s 17th hole, they are stepping on the same land where the Jamestown settlers stepped off their boat in 1607. Those settlers would later sail upriver and start what is now the United States of America at Jamestown. The old pilings in the river are the location of their original port and the beginning of the road from the James River to Williamsburg, the amazing Colonial town that’s still thriving 400 years later. To the left of the hole are the foundations of what was basically a pub, early warehouse, hotel and some say a brothel all dating way back before 1776. That’s 177 yards of history from the Native Americans to the Jamestown Settlers, Williamsburg, the American Revolution and Civil War to where LPGA players now tee off in an annual professional golf tournament. Kingsmill Resort is also the place where President Clinton, Bush (43) and Obama have come to meet, relax, work and rehearse for debates. Today golfers, families, couples and friends come to Kingsmill Resort’s hallowed ground to make their own history. And while you may not eagle this hole (which would be a hole in one, too) it’s quite common to see the American Bald Eagle flying overhead. They nest on the grounds of Kingsmill Resort. Perfectly fitting for the most historic 177 yards of golf, in America. Winston Churchill said, “Those who fail to learn from history are condemned to repeat it.” In golf, amateurs call this a mulligan, and if there is any golf hole in America to pause, stop, take it all in – and repeat – this is it.